Don’t let HP’s EliteBook heritage fool you—even though HP’s EliteBook x360 G2 comes with a business pedigree, this year’s laptop isn’t a boring black box that’s meant to be stowed at your desk. The 2017 EliteBook x360 takes its inspiration directly from the Spectre x360 beautiful convertible notebook that arguably is one of the best laptops for the year—which makes this business notebook exciting to use whether you’re at work in the boardroom or at home in the living room. Sleeker and more secure than even a MacBook Pro, the EliteBook x360 G2 marries seductively good looks with cunning intelligence. Speedy and powerful, this convertible combines HP’s refined design, the performance of Intel’s 7th Generation Core i7 processor and smart security features for data protection. Whether you want to shield your screen from prying eyes or get alerted when an offender tries to login to your system or insert an unauthorized flash drive, the EliteBook comes with a variety of different HP-developed security technology to keep your device and data safe. In designing the EliteBook x360, HP claims that it has merged the design of several different products to create the ultimate business convertible. Most evident is the 360-degree hinge and slim Ultrabook form factor that’s part of the Spectre x360, but the company also borrowed and improved the integrated SureView privacy screen from the EliteBook 1040 and the built-in conference call keys from the EliteBook Folio series. Like its consumer cousin in the Spectre, the machined aluminum construction gives the EliteBook x360 a premium feel. The silver, all-metal design is elegant and minimal, helping to keep the laptop slim, light and solid. The brushed aluminum lid is only interrupted by HP’s modernized logo, and a discrete strip that runs along the top housing the antennas for the wireless radios. Bluetooth and Wi-Fi are supported on all models, with select configurations also shipping with an optional 4G LTE modem. The only wireless technology that’s possibly missing is Intel’s WiGig support, which allows users to use a wireless dock on their desk. With a single Thunderbolt 3 over USB Type-C port, however, you likely won’t miss WiGig. A single USB-C cable can connect you to display, peripherals and power, making it just as versatile. In addition to the USB Type-C port, you’ll also have access to a full-size HDMI port for legacy connections, two USB Type-A ports split between both edges of the EliteBook, a Kensington lock slot, nano SIM tray (for models that support 4G LTE), micro SD card slot, combo audio jack and a Smart Card reader to appease the corporate overlords. Our review unit does not come with 4G LTE support. Unfortunately, HP reps informed me that you will need to choose a configuration with LTE at the time of purchase, since you can’t just upgrade after. I wish HP had gone with a similar strategy to the Elite and Spectre x2 series and made LTE standard or allow users to unscrew the bottom, purchase an approved LTE modem and install it should the need for wireless WAN arises. A small magnet keeps the lid closed when the EliteBook isn’t in use. Fortunately, despite its 2.82-pound body, the EliteBook x360 is well balanced, so you can open the laptop with just one hand—a feature that will likely delight Apple aficionados looking to switch. Measuring just 12.5 × 8.6 × 0.6 inches, HP claims the EliteBook x360 is the thinnest business convertible. This makes the EliteBook lighter than the 2.9-inch 13.3-inch Spectre x360 and just 0.1-inch thicker. The EliteBook shares the same thickness as Dell’s prosumer XPS 13 2-in-1, which comes with the same 360-degree hinge, but HP’s model uses a more powerful Intel 7th Generation Core i7 processor, rather than the power efficient Core M on the XPS. Even though you can also charge the EliteBook x360 over the USB Type-C port, HP ships its proprietary barrel-type charger out of the box, a compromise likely made to accommodate enterprise users. Unlike the Spectre, HP is a bit more selective with the USB Type-C chargers that will work with the EliteBook. While the Spectre was able to charge off of my Dell USB Type-C power companion, the EliteBook refused and a warning message popped up. While the EliteBook shares the same 360-degree hinge from the Spectre, the EliteBook takes a more angular approach with a flatter rear edge, compared to the more curvy Spectre. With the 360-degree hinge, you’ll be able to use the EliteBook as a laptop, in tent mode for presentations, with the keyboard facing down to consume media, as a tablet, or with the screen and keyboard flat on a table collaborate with colleagues. There are four bottom-firing speakers that are tuned by Bang & Olufsen. Unlike the latest 13-inch Spectre, the four speakers on the EliteBook are all located on the bottom—the Spectre comes with two speakers on top of the keyboard deck and two bottom-firing speakers. Instead of tuning audio for entertainment like on the Spectre, the speakers on the EliteBook are designed for natural sounding conference calls. In use, I found the speakers to be clean. Audio sounded more flat than the tuning on the Spectre x360, and I found that even though the speakers got loud, the sound volume didn’t seem as loud as on the Spectre. The B&O app gives you more options to customize sound. As a business notebook, VOIP calls sounded clear on the EliteBook.The noise cancelation works well to cut down background noise and keyboard sound, if you’re typing and multitasking during a call. Don’t let its good looks and slim size fool you. The EliteBook x360 is packed to the brim with security features that will help protect your data, BIOS and device. This laptop is truly a dream for IT managers who have to manage their company’s corporate security policies. Even if you purchase the EliteBook for personal, home or education use, you’ll still benefit from many of these built-in features. This makes the EliteBook more suited for the C-suite than prosumer devices, like Dell’s XPS series, and HP’s enterprise heritage really shines when the security features are compared against Microsoft’s foray into this space with its Surface Pro and Surface Book lines. Like the consumer-grade Spectre x360, the EliteBook x360 comes with an HD webcam at the top of the display, giving it a far more natural angle for video conferencing than Dell’s bottom placement. The HD camera also comes with IR sensors that support biometric login with Windows Hello, allowing you to use your face to unlock your PC instead of a PIN or passcode. Additionally, you can also choose to set up a fingerprint with the touch-based fingerprint reader that’s built into the keyboard deck. I found myself using facial recognition more than the fingerprint sensor, but having both is convenient. If the IR camera failed to recognize me, I still have a second biometric logon method. The EliteBook also supports vPro for remote management, TPM for data encryption and a Smart Card reader. Additionally, software like HP SureStart extends security beyond Windows Hello. SureStart not only protects the BIOS from attacks, but runs just before the BIOS starts. With SureStart, you’ll need to enter a password or login with your fingerprint even before the BIOS loads, giving you more protection than Windows Hello. The endpoint is important, Nash said, and SureStart runs on Intel’s vPro technology to protect the BIOS. HP WorkWise is another security client that is useful to consumers looking to adopt the EliteBook x360 as their convertible. The software runs on your EliteBook, and you’ll need to download the companion app on your iOS or Android phone—a Windows 10 Mobile client is in development, HP informed me—to pair to your PC. WorkWise is like LoJack for your system, and allows you to monitor your EliteBook when you’re away. If WorkWise senses that someone is logging in, it will notify you on your phone. Similarly, if someone picks up your device, closes the lid, opens the lid or even inserts a USB drive, you’ll get an alert. This helps to ensure that a malicious person isn’t walking up to your PC when you’re away at work to steal your data or try to infect your device with a bad USB drive. HP Sure Click helps to monitor security on the web, and can also safely store your web passwords and logins. With Sure Click, you’ll be able to login to your favorite sites by authenticating with a fingerprint. I found it more convenient than password managers, like LastPass, because of the biometric security integration. Even though the EliteBook comes with plenty of features to ensure your device is secure, HP has one additional feature that would make even James Bond gush. Called Sure View, the technology essentially allows HP to integrate a security screen directly onto the display without the need to carry a flimsy add-on. On select models with Sure Screen, you can press the F2 button and SureScreen will get enabled. When it’s turned on, you’ll only be able to see the content on your screen if you’re sitting directly in front of the device. Sure Screen essentially limits the wider viewing angles of the EliteBook’s IPS display to prevent visual hacking if you’re working on confidential information in a more public space. Giving the evolving nature of the workplace with remote workers, Sure Screen is a feature that I hope HP will port down to the Spectre and Envy line in the future, and it’s one that could be a game changer when HP refreshes its Elite x2 tablet. The technology was initially introduced on the Elitebook 1040 G3, but that device utilizes a TN panel. With the EliteBook x360 G2, HP had to tweak the technology to make Sure Screen compatible with this device’s IPS panel. With Sure Screen off, you’ll get the same wide viewing angles that’s typical of a traditional IPS display, allowing you to collaborate with nearby coworkers. Whereas the Spectre’s rounded corners and nearly bezel-less Micro Edge Display gives it an elegant look, HP is playing up the sharper angles on the EliteBook to give it a sleek, but more buttoned-up aesthetic. Sadly, this means that the Micro Edge Display doesn’t make an appearance on this year’s EliteBook x360. As a result, the EliteBook measures half an inch wider than the Spectre. Even lacking the Micro Edge Display, the EliteBook still benefits from slim side bezels, and the design sits somewhere between the chunkier bezels on the 2015 Spectre and the nearly bezel-free design of the late 2016 and early 2017 models. While only 1080p, the display is harp and crisp. Our unit didn’t ship with the Sure Screen technology, so we weren’t able to test it in this review, but HP’s demonstration on a nearly final prototype was impressive, and enabling or disabling the privacy screen was seamlessly fast. The display renders colors vividly, covering 110 percent of the sRGB color space. Unfortunately, though, the screen wasn’t as bright as I’d hope for. The EliteBook’s display looks fine indoors and under ambient office lighting, but I found myself turning up the brightness. Outdoors under partial shade and direct sunlight, the display was not usable. The reason is that the brightness topped out at just over 240 nits, which is short of the Ultrabook average of 300 nits. Rather than reach for the a regular notebook or print forms to fill out and sign, you can instead rely on your EliteBook x360 as your laptop, notepad and and canvas. In a confusing move, likely to support legacy users, the EliteBook and Spectre x360 lines diverge in their support of digital inking technology. Whereas this year’s Spectre uses the same N-Trig pen that Microsoft uses in its Surface products, the EliteBook x360 opts for Wacom technology. If you happen to lose your pen or need an extra one, be careful of what model you order from HP’s website, as N-Trig and Wacom technology do not work together at this time. I found inking to be accurate and fast, and the pen has a good feel on the screen. Like the Microsoft Surface Pen, the eraser on top also serves as a button, which you can configure to launch your favorite inking apps, like Microsoft OneNote, Windows Sticky Notes or take a screenshot and annotate. This quick launch button is missing from the pen that ships with the Spectre line. Wacom’s software allows you to configure the pen’s behavior and you can map the buttons as well. In my testing, I was not able to properly configure the top quick launch button going through both the Windows Inking settings and the preloaded Wacom app. The HP Active Pen ships with the EliteBook, but there isn’t a silo in the laptop to stow the accessory. Including a silo would require HP to create a smaller pen that isn’t as ergonomic, Nash explained, or it would require a thicker notebook design. As a compromise, HP includes a sticker with a pen loop that you can attach either to the base or lid of your EliteBook to stow your pen when traveling. HP also sells a pen holder accessory that slides into the Smart Card reader for a more seamless look. As I am not an artist by any stretch of the imagination, I can’t comment on the EliteBook’s inking capabilities as a digital canvas. As a digital notetaker, however, I found the pen to be a joy to use. The tip offered a good amount of friction when writing against the 1080p glass display, and I found that the pen was able to keep up with my writing, even when I jotted quickly, with good sensitivity and accuracy. HP offers the EliteBook x360 G2 in a variety of different configurations and pricing. Our review model ships with Intel’s 7th Generation Core i7 processor with vPro support, 16GB RAM and 512GB SSD. The convertible is equipped with a FHD display, but our model does not come with the Sure Screen technology to thwart prying eyes. The HP Active Pen is included in the box. As configured, the EliteBook x360 retails for $2,500. Although the configuration seems significantly more expensive than a similarly equipped Spectre x360, you do get a lot more features on the EliteBook. The $1,349 Spectre, for example, isn’t loaded with all of the EliteBook’s privacy features, only ships with a one-year warranty, and doesn’t come with the military testing certification or spill-resistant keyboard. The EliteBook x360 G2 can also be configured with either a 4K display or a privacy screen. Sadly, you can’t configure the laptop to come with both a UHD panel and Sure Screen technology. Adding either technology to your build will have a negative impact on battery life. Even though the EliteBook with a 1080p panel is rated for 16.5 hours of battery use, enabling Sure Screen, Nash said, takes the battery down to about 12 or 13 hours. Road warriors will likely choose the 1080p configuration and only enable Sure Screen when needed. In use, the EliteBook is a speedy performance, and I found the device to be equally fast as the late 2016 Spectre x360 13-inch. Both notebooks share a similar FHD display and is powered by a similar 7th Generation Kaby Lake processor from Intel. The big difference is that the EliteBook comes with a slightly newer Core i7 version that supports a faster clock speed, faster turbo speed and comes with vPro support for enterprise-grade security. Because of the faster 2.8GHz base speed and 3.9GHz performance with turbo boost, the EliteBook fared slightly better than the Spectre x360 in benchmarks. Regardless of which notebook you choose, you likely won’t notice any difference in real world performance in your daily use, running basic office productivity apps like Microsoft Office, playing videos, casual gaming and some creative work. The EliteBook scored marginally better than the Spectre in both Geekbench 4.0 and PCMark Home benchmarks. The former scored 4,509 points and 8,767 points respectively on single core and multi-core performance, respectively, compared to the latter’s scores of 4,087 and 7,509. In similar CPU and discrete GPU benchmarks, the EliteBook’s performance was either better than or in line with similarly equipped notebooks. I’ve raved enough about the performance of Intel’s processor in my Spectre x360 review, which you can reference for additional performance comparisons. If you decide to purchase a Spectre, you won’t be disappointed—it’s a light machine that performs well, and even under heavy load, it manages to stay cool. Under stress, the fan does kick in, but you’ll barely notice it. Fan noise is quiet and not distracting. Most of the heat, though, is felt on the top right corner of the keyboard deck. However, even when the laptop gets hot, the EliteBook still feels cool, and you won’t have any issues holding the device as a tablet or using it on your lap as a laptop. The EliteBook still manages to keep cool under pressure, and that’s something that we can’t say about Apple’s previous generations of MacBook Pros. The integrated Intel HD Graphics 620 delivered solid performance, but if you’re crunching a lot of numbers or want to play more intensive games, you should either look towards a workstation or gaming rig. For most tasks, including photo editing, light video work and casual gaming, the EliteBook will perform fine, especially if you turn your game settings down. Simply put, the keyboard on the EliteBook is a joy to type on. Despite the convertible’s slim profile, HP didn’t skimp on the keyboard, offering a responsive typing experience with chiclet-style keys. The keyboard is backlit, with several adjustable lighting levels, offering more flexibility than the simple on or off lighting that’s on the Spectre. I prefer the black keys of the EliteBook over the silver Spectre’s silver keys—the darker keys offer more contrast in low light. The keyboard is clicky, responsive and dampened. HP says the keys have 1.2mm of travel. But because the keys are stiffer and require more force to activate, it feels like you’re typing on a keyboard with deeper key travel. I never found myself bottoming out, and I was able to type quickly and accurately. This is important to reduce finger fatigue and strain, and the experience is far more comfortable than the shallow keys on Apple’s competing MacBook Pro systems. Compared to Dell’s XPS 13, the keys on the EliteBook are more responsive. I found the keyboard too shallow and mushy on the XPS 13, and the lighter actuation force on that keyboard means that I bottomed out quicker than I’d like when typing. As an enterprise notebook, the EliteBook x360 G2 also comes with a spill-resistant keyboard, a feature missing from consumer laptops that are often substituted for business use, like Microsoft’s Surface Book, Dell’s XPS 13 series and even HP’s well-received Spectre x360. Unlike other spill-resistant keyboards in HP’s lineup, the keyboard on this convertible doesn’t have drain channels on the bottom. HP reps told me that if you accidentally spill liquid on the laptop, you just need to flip it upside down and shake the water out. The dedicated conference calls keys on the function row is a nice touch, but those keys are not configurable. By default, they only work with Skype for Business calls, so you can’t use the keys in other applications, like Google Hangouts, Slack or another VOIP service. Similar to other high-end notebooks in its class, the EliteBook also offers a spacious trackpad that’s wider than it is tall. I never found myself aching for more room on the trackpad, and the size is more manageable than on the most recent MacBook Pro with Touch Bar EliteBook’s trackpad is large enough to be comfortably, but not overly large that you’ll accidentally touch it or swipe it when you’re typing or performing other tasks. Coupled with an accurate touchscreen, inking capabilities and a comfortable keyboard, I doubt many users will even need or desire a larger tracking surface. With video playing in a loop at medium brightness HP rates the battery life of the FHD configuration of the EliteBook at 16.5 hours. In actual use performing everyday work tasks— working in documents, preparing PowerPoints, running spreadsheets, checking email, browsing the Internet, streaming videos and checking the news—I averaged just over 10 hours of battery usage. Even though my results were short of HP’s claims, 10 hours meant that I could leave the power brick at home. For mobile workers working in coffee shops, at a restaurant or in the field, 10 hours of battery life will mean that you won’t need to hunt for a power outlet. And when you do need to recharge, you’ll be able to recharge half your battery in as little as 90 minutes with HP’s fast charging technology. Another area that the EliteBook x360 G2 shines over its consumer Spectre x360 cousin is in rugged durability. Neither laptops, to be fair, are marketed as rugged, but their strong all-metal machined construction coupled with HP’s attention to detail mean that both laptops are solid, feel durable and should last you for a long time. With the EliteBook x360 G2, HP went the extra mile, and the laptop passes Military Standard 810 testing, which should give road warriors additional peace of mind. If there is a thing such as laptop envy, you’ll definitely know it when you see your office issue your colleagues one of these new beauties. 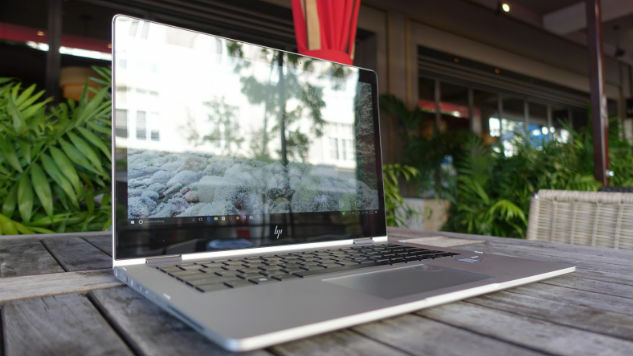 Given the cost of our review configuration, prosumers likely won’t rush out to buy the EliteBook, and that, HP admits, is okay—there’s a Spectre with features that are just as compelling. Beneath the EliteBook x360’s beautiful silver exterior lies a powerful workhorse packed with security and manageability features. But the real killer feature this year is HP’s Sure Screen, an integrated privacy screen that can be enabled with a press of a button. This makes the EliteBook x360 the business laptop to beat this year—HP packed the best of its enterprise technology in a laptop that’s sleek enough that you’ll want to continue using it after you leave the office. If you demand a business warranty, all-day battery life, a durable and beautifully crafted system that delivers speed, security and performance—and you can live without discrete graphics—the EliteBook x360 G2 is unrivaled. Whether you use it as a convertible or a laptop, HP’s winning design makes the EliteBook x360 G2 the business laptop to beat this year, and as such, is worthy of an editor’s choice.